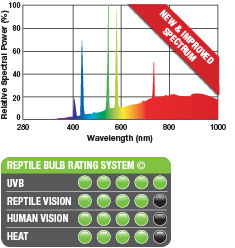 The Exo Terra Solar Glo is a selfballasted mercury vapor reptile bulb that provides the benefits of natural sunlight, which is one of the most important aspects in keeping reptiles healthy. The Exo Terra Solar Glo is the choice of professional breeders as it provides the proper balance of ultraviolet light (including UVA and UVB), visual light and infrared light (heat), in one easy-to-install bulb. The Exo Terra Solar Glo is a full spectrum light with carefully tuned peaks to ensure appetite, activity, brilliant colours, and optimal calcium absorption through Vitamin D3 production. The Exo Terra Solar Glo is a selfballasted mercury vapour lamp, which fits into a standard ceramic socket (No ballast needed). Can be used with the Exo Terra Light Dome (PT2057) or the Exo Terra Wire Light (PT2062). The Exo Terra Solar Glo is available in two wattages: 125W and 160W. Reptech HID UV ballast De Reptech HID UV lamp zijn gebaseerd op de High Intensity Discharge technol..
PT2327 Exo Terra Sunray Lamp 50W Benadert natuurlijk zonlicht Optimale verhouding van licht, U.. Solar Raptor Gemengde Lichtstraler 80W PAR 38 230V De SolarRaptor gemengde licht straler 80w is .. Solar Raptor Gemengde Lichtstraler 100 Watt PAR 38 230V De SolarRaptor gemengde licht straler 10..